For this award the judges were looking for evidence a of year-round communication approach to investors that provides insight into how sustainability and environmental, social and governance (ESG) risks and opportunities are identified, understood and proactively managed and measured to contribute to competitive advantage. 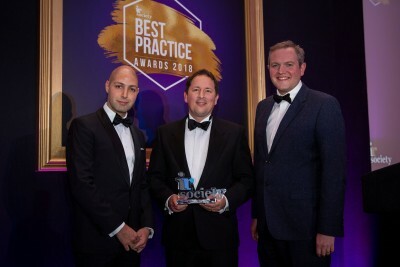 Congratulations to BASF, a standout winner who demonstrated a very thorough and well-integrated and measured approach to their ESG communications. Judges particularly liked the savvy use of social media content around sustainability. First class, well done! 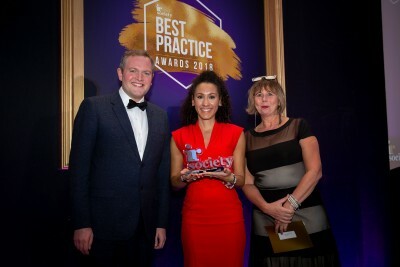 (From left to right) Miles Jupp, Nicolle Oliver from the IR Society (on behalf of BASF) and Jacqui Dobson from the FT.
Congratulations Howdens Joinery, you are a winner! The judges commend you for a distinctive and well presented report throughout, with excellent communications around inclusion and diversity. Great job Howdens Joinery! (From left to right) Alex Watkins from J.P. Morgan Cazenove, Paul Sharma and Simon Gleadhill from Howdens Joinery and Miles Jupp. ​The judges would like to highly commend G4S for demonstrating how social responsibility was well integrated into their strategy. Congratulations to Lloyds Banking Group who presented extremely well with good sustainability focus in the Chairman’s statement. The judges acknowledged the nice metrics used to measure non-financial KPIs, and very good integration between risks, KPIs and remuneration. 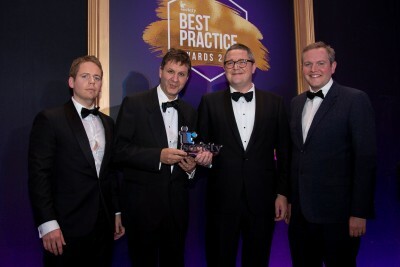 (From left to right) Reza Eftekhari from Morrow Sodali, Douglas Radcliffe from Lloyds Banking Group and Miles Jupp. The judges would like to highly commend Royal Dutch Shell for a very well joined up report that included a wealth of information.